The rich history of Egypt has provided famous examples of board games played in antiquity. Each of these games provides evidence of contact between Egypt and its neighbours. From pre-dynastic rule to Arab and Ottoman invasions, Egypt's past is visible on game boards. This volume starts by introducing the reader to board games as well as instruments of chance and goes on to trace the history and distribution of ancient Egyptian games, looking particularly at how they show contact with other cultures and civilizations. Game practices, which were also part of Egyptian rituals and divination, travelled throughout the eastern Mediterranean. This book explores the role of Egypt in accepting and disseminating games during its long history. Over the last few years, the extent and the modes of contact have become better understood through museum and archival research projects as well as surveys of archaeological sites in Egypt and its surrounding regions. The results allow new insight into ancient Egypt's international relations and the role of board games research in understanding its extent. Written by three authors known internationally for their expertise on this topic, this will be the first volume on Ancient Egyptian games of its kind and a much-needed contribution to the field of both Egyptology and board games studies. Walter Crist is a leading expert on Cypriot board games and a PhD candidate in archaeology at Arizona State University. Anne-Elizabeth Dunn-Vaturi is a Research Associate in the Department of Ancient Near Eastern Art at the Metropolitan Museum of Art, New York, and is pursuing PhD research at Leiden University, the Netherlands, on the game of Hounds and Jackals. Alex de Voogt is an Assistant Curator at the American Museum of Natural History, New York, and a leading researcher of board games in Africa and the Middle East. 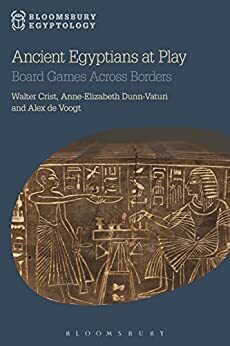 An excellent survey of the archeological record on Egyptian board games, both within Egypt as well as around the rest of the region. The information about games found outside of Egypt was novel to me, and gave insight into the relationship between these cultures, and the way that ideas spread and take root in different regions. The authors are cautious about speculating on game rules, roles in society, and other details without specific information to back them up, which was refreshing.